BUFFALO, N.Y. -- Donte DiVincenzo scored 21 points and NCAA Tournament top seed Villanova shook off a slow start and stumbled forward in the East region Thursday night with a 76-56 victory over No. 16 seed Mount St. Mary's. The Wildcats (32-3) weren't themselves for much of the first half before they opened the second half with a 21-6 run to take the first step toward defending their championship. 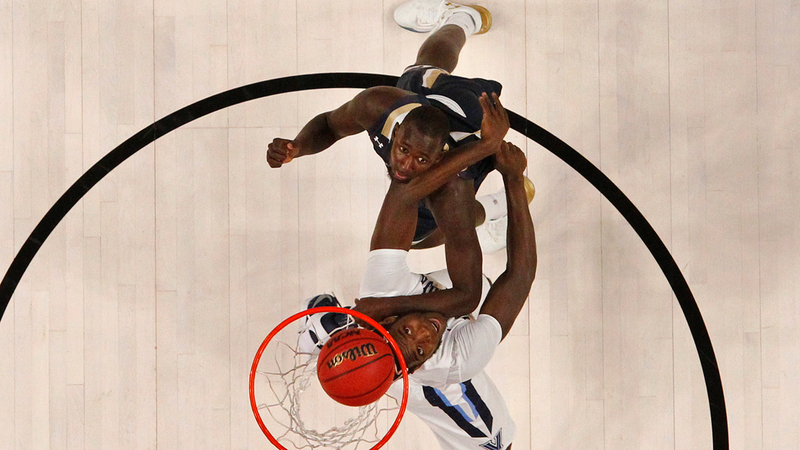 Villanova is trying to be the first back-to-back titlist since Florida in 2007. Since the NCAA went to seeding in 1985, No. 1 seeds are 130-0 against No. 16s. The historic upset remains elusive, but for a while it looked like it could happen inside KeyBank Center. Freshman Miles Wilson scored 22 points as the Mountaineers (20-16), who edged New Orleans in a First Four matchup on Tuesday, gave the defending champions all they could handle for 20 minutes. But the Big East champions regrouped at halftime and reserved a date with either Wisconsin or Virginia Tech on Saturday. Villanova not only survived a tough test from the Mountaineers but a horrendous shooting night by senior Kris Jenkins. The hero of last year's NCAA title game, when his 3-pointer at the horn defeated North Carolina, Jenkins missed his first 10 shots and finished just 2 of 13. The Mount St. Mary's players wear warmups with "Mayhem" written on the back, and they caused quite a commotion in the early going. Showing no fear against a team the smart-money guys in Las Vegas said would beat them by 25, the Mountaineers jumped to a 10-2 lead against the Wildcats, who missed their first eight shots, committed two turnovers and had three shots blocked in the opening 5 minutes. Villanova's players looked nervous and played that way, and when Mount St. Mary's Elijah Long threaded a no-look pass to Chris Wray for an easy basket to put the Mountaineers ahead 23-20, two seminarians - one of them clutching Rosary beads - from the tiny school in Emmitsburg, Maryland, high-fived in the stands. Villanova, though, recovered and took its first lead at 26-25 when Eric Paschall powered home a dunk with 2:33 left in the half. The Mountaineers left the court at halftime down only 30-29 and full of confidence. Villanova senior Josh Hart, who sat more than 8 minutes in the first half with two fouls, opened the second half with a layup and DiVincenzo, who added 13 rebounds, knocked down a 3 to cap a 13-2 burst that knocked the air out of Mount St. Mary's. Before long, the Wildcats were having their way, and except for DiVincenzo missing two breakaway dunks, Villanova showed why many believe they can win it all again. Jenkins has been struggling with his shot for some time. He's 28 for 83 in his past seven games. Villanova coach Jay Wright worried all season about his team being satisfied after winning last season's title. He had been warned by other coaches that there would be a hangover, and sure enough he sensed the Wildcats being complacent. He credits his seniors for keeping the group focused and said a trip to Spain allowed his team to step away from the spotlight long enough to gain some perspective. "It was great," he said, "because no one knew who we were, they didn't know we were national champions. It gave us a fresh start. But when we got to the baggage claim in Philadelphia and everyone saw we were there, and they started coming up and taking pictures, it hit all of us, 'Oh, we're back in it. We're going to have to deal with this.'" Villanova: The Wildcats showed why they're champions by stepping up when it counted, shooting 63 percent in the second half. DiVincenzo has emerged as major contributor of late, something Nova has needed with Jenkins struggling. Mount St. Mary's: With all five starters coming back, the Mountaineers should be in position to get back in the NCAA field. Villanova: Plays the Wisconsin-Virginia Tech winner on Saturday for a spot in the Sweet 16.